Discussion in 'Displays' started by Phlorge, Apr 27, 2017. Oh ya, I am in for two! Haven't seen this large of a leap in monitor technology in a VERY long time. I think this and the asus are going to be very pricey. But I finally know what my requirements are for an upgrade.. and this has them all. elation and Armenius like this. The Predator X27 seems to have found a great balance between image quality and speed. At the very least, it is the first 4K monitor with HDR support running at 144Hz. It also supports G-Sync for smooth game play with compatible Nvidia GeForce graphics cards and GPUs. If it's brightness you crave, the Predator X27 is rated to hit 1,000 nits courtesy of 384 individually controlled LED zones. Most monitors offer a brightness level of between 250 and 350 nits. Beyond the brightness level, Acer says its panel offers up 99 percent coverage of the sRGB color space. It also features Quantum Dot enhancement film technology, 178-degree viewing angles, Nvidia's ULMB (Ultra Low Motion Blur) technology, and Tobii eye-tracking technology. GoldenTiger, Armenius and GameLifter like this. ULMB will be interesting in combination with the high brightness FALD. They can make it scan from top to bottom to reduce crosstalk and also it should work at much higher brightness ofcourse. GoldenTiger, Q-BZ and Armenius like this. lol look at the very bottom of the press release for an Easter egg. 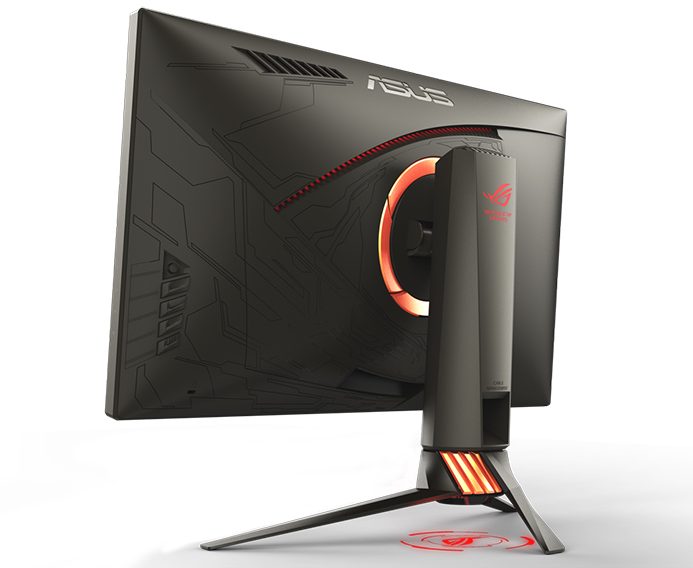 Come on Acer you guys have a 32 inch 4k gsync monitor while Asus doesn't. Bring out a 32 inch version of this baby and I'd gladly drop 2 or even 3k for it. Make it happen! Glad to see some competition to the ASUS model! Of course both are going to be super pricey on launch but they might be worth it going by the specs. I just hope the quality control is good on both of them. Is there a reason the bezel is so thick? Is that because it's a FALD monitor? Aye. If I'm spending thousands of dollars I want some surface area! It's really the number of FALD zones that requires the thickness it has. It is also pretty deep. This is the ASUS version Couldn't find a better picture, but you can get an idea of its depth from the shadows and curve along the top. There are monitors that attempt to do FALD through edge lighting only, and I would stay away from those. Pretty sweet looking. Although i could do without the hood and the eye-tracking bar. I also see ACER pretty much copied ASUS's OSD button layout/joystick setup. Does this have FALD like Asus PG27UQ or Not ? Yes, there are three monitors with this same FALD panel. This Acer, the ASUS and now a Dell (although the Dell is aimed at professionals and only does 60 Hz). A dead give-away is any monitor that lists 1000-nits it's almost assuredly going to have a FALD back-light. Armenius and GameLifter like this. Too much bezel on these 4k hdr's. Accurate representation of the 384 zones. GameLifter and Armenius like this. I have been waiting for this thing! Sad I will let my X34 go for this. And yeah I am in agreement that if this came in 32in for 2k it would be a day 1 buy. Love this not sure if I can give up 21:9 after having it though. Gimme a 21:9 version and I'm all in. Exactly. Non-ultrawide G-Sync displays above 27-28" can be already counted with one hand, that's the area where we need more options. I am happy with my 27" 1440p display as I feel it's a perfect size/resolution ratio but for 4K I want something just a bit bigger, 30-32" would be perfect. But I guess they are at the mercy of panel manufacturers so unless AO or Samsung come out with a 32" 4K 144 Hz panel then we'll just have to keep waiting. 200 Hz u wot? Which monitor are we talking about or what are these guys smoking, 200Hz ULMB would be really nice. Ya this is great and all but wtf is with a 2-3k priced high end 4k monitor at 27"? Are they serious? I mean am I the only one who wants all that and at least 34"? I mean in using a40" 4k now and I freaking love the immersion for gaming so going down to 27" is a no go. Especially at that price??? Come on. I know alot of you guys are overjoyed at dropping that much for such a"loaded" screen but man not me. I don't mind spending but I want some dam real estate to go along with that fucked price tag. I mean this thing is going to cost what a high end OLED TV costs. Hard to swallow. Anandtech says it uses 4:2:2 chroma subsampling while gaming to stay within the bandwidth confines of DP 1.4. Isn't that a big no-no with monitors? Or does it not matter for gaming? Is it just gaming? What about desktop usage at 144hz? I believe DP 1.4 can do 8-bit (24-bit) 4:4:4 with 4K @ 120Hz. Beyond 120Hz, you'll need double cables due to bandwidth, or else you'll encounter compromises. I know. Even the PG258Q, a 240 Hz display, caps out at 144 Hz for ULMB. True. It's not like we'll be getting close to 144 FPS in 4K anytime soon. Capping the refresh rate at 120 Hz will be fine by me. Hopefully the firmware will allow 4:4:4 chroma with HDR at 120 Hz or less. Limited and scattered release by year's end for this as well if we're lucky? Or just games a few years old. I hit 200+ FPS consistently in CSGO. Many games you actually want the high FPS in aren't graphically demanding. The 4:2:2 makes no sense to me. Why spend all the time and money building a monitor with high res, high refresh and HDR and then gimp it with subsampling at full power. This monitor already requires a 10 series or better Nvidia card and will cost probably $2000 on launch. The people who will be buying it want the best, they don't want subsampled images when run at 144 FPS. Yeah it looks and sounds spectacular but after having 34inch I just cant go back to something smaller. Heck I want something bigger! 40"- 50" 4k @120+Hz is what I want. mikeo, Xinmosni and Savoy like this. This 4:2:2 without DSC sounds like pure speculation to me. Unlikely just speculation, DisplayPort 1.3 doesn't have enough bandwidth for 144 Hz uncompressed. If my memory serves me right, DSC that version 1.4 uses is limited to 120 Hz max, but don't quote me on that, couldn't find confirmation. "144 Hz (w/4:2:2 Choma Subsampling)"
The most important thing with DP 1.4 is dynamic stream compression. The question is if this monitor has DP 1.4 as advertise, why wouldn't they use DSC? DP 1.4 can do 4K @ 120 Hz 4:4:4 with HDR and 10-bit color. You could bump it up to 144 Hz if you use 8-Bit color. That is the speculation reference. They didn't state if Acer said that or not. There are too many variables unknown to do a bandwidth calculation. We don't even know if the new G-Sync chip is using DSC and at what color bit depth. Ah. Anandtech were listing that as if it came from a spec sheet, not as speculation. They've really gone downhill since Anand left. With DSC, DisplayPort 1.4 has enough bandwidth for 8k resolution at 60 Hz and 4:4:4 10-bit colors, which is much more than this monitor would require. I tried to say DSC just doesn't support higher refresh rates than 120 Hz. DSC has nothing to do with refresh rates. You could run 640x480 at 800 Hz if you wanted to via DP 1.4 using DSC. According to Linus the price is $2k. Not surprising but if it's as good as we think it will be I may need to clear out the credit card! Putting aside the price, the specs are almost perfect for me, except for the screen size. I'd prefer to have those glorious 4k pixels on a screen that is at least 32"
And they are almost perfect for me too , but how will the black levels be for 27'' 4k gaming monitor with ( IPS + FALD ) VS current Dell UP3017Q OLED and C7 OLED TV . The peak brightness is great ( 1,000 nit ) but we need a real black levels beside the brightness for 2k$ . I'm in the same camp. However, it's at least a breath of fresh air to see the tech catching up. I'm hoping to see 30" and larger with the second wave of these panels hitting the market.